Riding my bike this weekend, I came across a vulture eating a squirrel. Last weekend, I spotted a peacock in another part of town. Both times, the birds were standing in the middle of the road. They seemed cautious as I rode up, but not overly concerned. Both were beautiful in different ways, though it’s hard to tell from the phone photos. 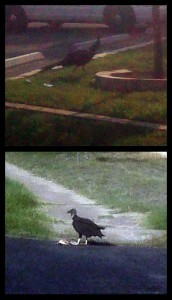 The vulture wasn’t hideous; shiny black feathers, gray bands running up its neck and head. The peacock was all irredescent blues and greens, though it didn’t see fit to show me much plumage. Sometimes you get one, sometimes the other. Last week I found a baby squirrel on my porch. I’ve been nursing it and trying to help it be a good squirrel. I even had to potty train it… It feels strange how instantly attached i am to a creature that I know is “wild” and still so vulnerable to anything. When reading “the vulture eating a squirrel”, i get immediately defensive, while at the same time I understand the beauty of nature doing its thing, going about its business.